Welcome! Dr. Cynthia Genovese, a member of the prestigious and distinguished American Academy of Family Physicians, has dedicated her medical practice to caring for three generations of family members. She is committed to making Genovese Primary Care convenient and accessible to all of her patients. With individualized attention, each member of your family receives comprehensive healthcare from a qualified, experienced and caring medical doctor. Building relationships with patients, Dr. Genovese builds a bond of trust and establishes a level of confidence that you and your family can depend upon. Dr. Genovese recognizes how hectic life can be. With a goal to provide patients with the highest standards of medical care and personal service available, the focus is on listening to patients and answering all concerns in a welcoming, friendly and comfortable environment. 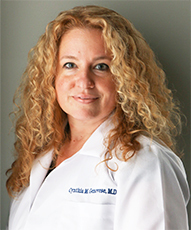 Dr. Cynthia Genovese is board certified in family medicine and is a diplomat of the American Academy of Family Physicians. She graduated with her medical degree from the University of Bologna School of Medicine in Bologna, Italy and completed her residency at Bryn Mawr Hospital in Bryn Mawr, Pennsylvania. While in medical school, Dr. Genovese was drawn to primary care medicine, recognizing as a primary care physician she could realize her passion to care for both children and adults by practicing family medicine. Genovese Primary Care promises to provide professional, compassionate care to three generations of family members by emphasizing preventive health and education, medical screenings and lifestyle modifications to ensure a lifetime of optimal health. Providing superior quality and individualized attention, we take pride in seeing you promptly in a caring and respectful fashion, focusing on the whole body, while treating the health and well being of each patient.